Ecumenical dinner marks Week of Prayer for Christian Unity. Published 1/26/2018. Local. 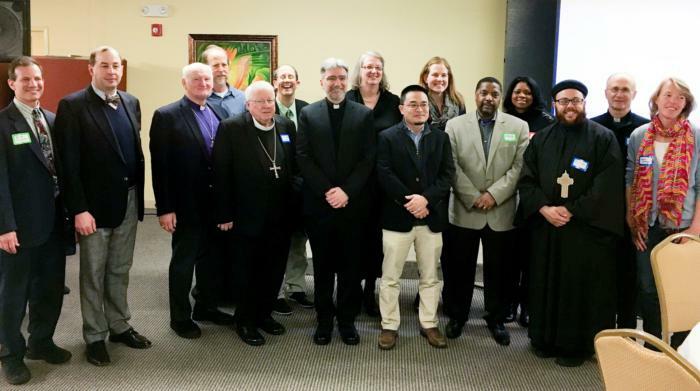 BOSTON -- Relationships were built and fellowship experienced during an ecumenical dinner gathering, Jan. 20, that served as the anchor event for this year's annual Week of Prayer for Christian Unity. Traditionally celebrated Jan. 18 to 25, the Week of Prayer for Christian Unity is an international initiative that invites Christians from different congregations and parishes all over the world to come together to pray for unity. In recent years in the Boston area, the week is marked by gatherings of prayer and fellowship coordinated by the ecumenical organization UniteBoston. Last year, the week was marked by a special prayer gathering at Holy Name Church in West Roxbury that saw hundreds of Christians and Christian leaders attend. The Archdiocese of Boston and the Institute for Christian Unity worked with UniteBoston to host the event, which organizers at the time called a positive and quantitative "leap" in ecumenical relationships. This year's anchor "Fellowship Dinner" was meant to build on the many relationships created during last year's gathering, and help form "solid relationships" between the Catholic, Orthodox, Evangelical and Protestant Christians who attended, said Vito Nicastro, associate director of the Archdiocese of Boston's Office of Ecumenical Affairs and an organizer of the event. Speaking to The Pilot Jan. 23, Nicastro said the dinner was "exciting, fun, diverse" and "spiritually fulfilling"; an "exceptional event" in the long series of annual Weeks of Prayer for Christian Unity. It was "satisfying, because we felt we made a new contribution to Christian unity," he said. Around 70 people attended the dinner, which was held at the Congregation Lion of Judah church in Boston. Among those were a number of local Christian leaders, including retired Boston auxiliary Bishop Arthur Kennedy. In a statement to The Pilot Jan. 24, Bishop Kennedy said he was "very pleased to represent Cardinal Seán and to confirm his dedication to the unity of faith among the Christians in the neighborhoods, cities and town throughout the Archdiocese of Boston." "The annual celebration is important to remind us of this important aspect of the Church's mission together with other believers," he said. While the Jan. 20 dinner was the anchor event of the week, from Jan. 18 to 25, similar dinners coordinated by UniteBoston were held in local churches across the Greater Boston Area. Scott Brill, co-founder of the Institute for Christian Unity, said following the event that "sitting down to share a meal with bishops, pastors, lay leaders and lay people helped me get to know their stories of growing Christian unity and I left the evening really encouraged." "Last year's gathering advanced the work of Christian unity broadly; this year's gathering deepened it," he added.